Adam (navy blue) faces off against his friend Timmy. I don't remember when Adam scored his first soccer goal, but I do know that by the second season, he was scoring several goals per game. He would get excited and do his little victory dance, as seen here. Nowadays, he scores soccer goals and just casually walks back to the starting line, almost as if he is disappointed that play has been interrupted (something like a slot machine addict being disappointed when they hit a jackpot). He is too proud or jaded to do a victory dance, but he does keep track of exactly how many goals he scores. OK, I guess he is still quietly proud of his goals. 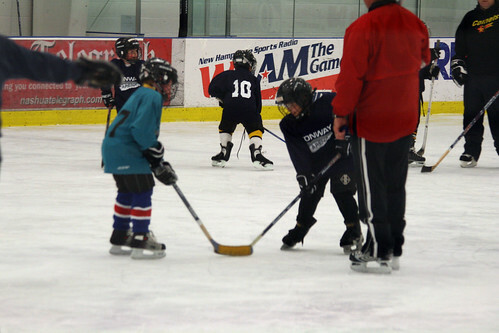 Adam started playing ice hockey last September and a hockey goal has been far more elusive. There is a wide range of skills among the players, so in his first 12 week session, he barely even got to touch the puck. He settled into playing defense, and spent most of his time batting the puck out of the defensive zone, or hugging the blue line in the offensive zone. By the second session, his skating skills vastly improved and he started to play better defense, actually making key saves. Now, in the third session, he has finally felt more comfortable playing offense. He did score a goal a few weeks ago, only because the captain (who had already scored four goals that game), passed him the puck instead of scoring again himself, as there were no defense men there. We have been encouraging Adam to take the puck and dribble it, instead of passing it or just batting it away. In his last game, Adam finally started to take these opportunities and have shots on goal. And then he scored his first bona fide goal. He took the puck across the blue line, with defensive players skating next to him, dribbled it down to the goal and took a shot. It went past the goalie and he raised his arms and stick in victory. I cheered in the stands, but not too loudly. Don't want to be one of those obnoxious hockey moms. I was completely beaming the rest of the day, congratulating him over and over. I don't know who was prouder, Adam or me. Now that he finally has a taste of success, I can see him becoming a great player someday. I can safely say that he is better than I am at hockey! Yay Adam! Congrats! It must have been exciting to watch. I wrote an article on my blog called The Best Events of The Year - One Mom's Observation of Youth Basketball which is about watching them take those steps toward success. I can't help but be fully present in the moment because I know this time we have with them is so precious and short. Please feel free to let me know your comments!